The proposed project, headed by HYM Investment Group, would be demolishing much of the garage that currently sits adjacent to the Government Center plot, paving the way for six new buildings that is projected to host 771 residences, 1.3 million square feet of office space, 1,100 parking slots, and 82,500 square feet of retail space (food and shopping combined). 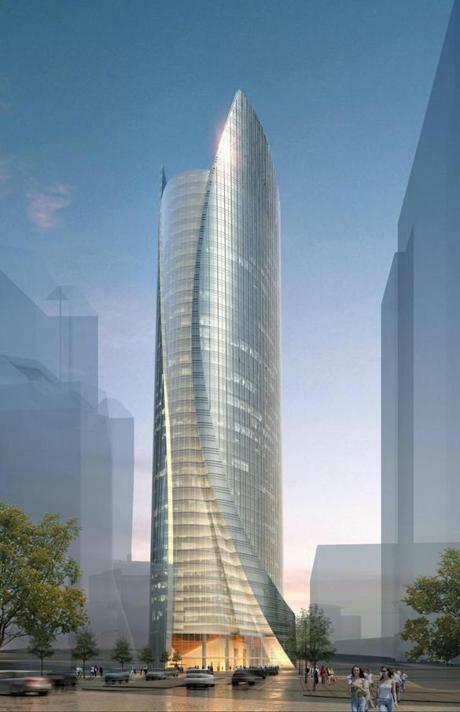 The 600-foot tower is set to be the city's crown construction being its tallest building in sight. In addition to this, the plan also calls for a pair of large residential buildings - one standing 470 feet high, and another at 275 feet. Combined, the three towers will be located on the western side of Congress Street closest to Government Center. Not too far from this site, the developer is also proposing to build a 275-foot mixed use condominium hotel, that will also host additional offices and retail stores. Once completely laid out, the new buildings are set to form a new public square along the sprawling Rose Kennedy Greenway. Once approved by the Boston Redevelopment Authority, the said-to-be $2 billion project is slated to start at the end of this year, and will occupy 4.8 acres of government-owned and regulated land. The project will be welcome addition to the mostly-posh and heavily office-centric location that, up until this project, only has traditional mid-rise developments. Originally, the site was planned to be redeveloped back in 2007 via a joint venture between the National Electrical Benefit Fund and British-based Lewis Trust Group, however the real estate collapse that followed soon after indefinitely halted construction plans. With the project pushing through, experts are estimating the development would produce about $11 million in annual tax revenues, and would generate an estimated 2,600 construction jobs for the city. HYM is also responsible for the highly-acclaimed North Point development in East Cambridge, and is also a majority stakeholder in the 20-story luxury apartment complex in the Innovation District, dubbed as Waterside Place. Aside from this big BIG breaking news, Boston has also seen multiple plans to erect skyscraper buildings throughout the city since the beginning of the recession's end last year. In particular, projects such as the Christian Science Plaza's redevelopment and addition of a 700-foot condominium and hotel, as well as Copley Place's vertical expansion are currently on the pipeline and are slated to begin within the summer season. Fenway Center, although still under consideration, is also poised to give rise to a new skyline west of the city. In fact, development is already on the way for the parcel fronting The Landmark Center in Fenway-Brookline area. Indeed, Boston is headed towards realizing its real estate potential, which was once thought to be non-existent due to it's citizen's upheaval against skyscraper that in traditionalist's view, is detrimental to the overall historical feel of the city. However the city, together with developers and residents alike, have more recently seen eye-to-eye redeveloping areas that need modernization and a fresh look. More importantly, Bostonians are realizing that these developments greatly contribute to the city (and the state's) overall economic recovery, creating jobs and jump-starting as well as maintaining the recent real estate rebound. Checkout our blog for more recent development news!